The population of non-believers is increasing rapidly. This is probably because more people understand the idea of atheism today than before. For many years earlier, atheists were apprehensive about coming out in public because they feared being persecuted and ostracized by religious believers and devout individuals. But, this does not seem to be the case today as more people are able to comprehend the different ideas associated with atheism. Atheists have accomplished this change by using a variety of things to endorse their points of view among those who did not understand them completely, earlier. For example, an inspirational atheist button allows non-believers to express themselves and in turn enlighten others about atheism. These atheist buttons not only make you look more stylish but also help you stand out in a crowd. Additionally, they help you to inform people about atheism and rectify their incorrect notions. If you are wondering how to get yourself an atheist button, The Atheist Republic is happy to introduce you to many fascinating designs that will help you effortlessly up your fashion quotient. Wearing a button with inspirational quotes, phrases or symbols related to atheism will help you catch the attention of those who do not know much about subject. While you do stand the risk of coming across as too confrontational with these unique accessories, approach the situation with some positivity and use the opportunity to explain to others what you are trying to accomplish in the process. We believe, the more we use products related to atheism, the more comfortable others will feel to discuss and share information about the subject. 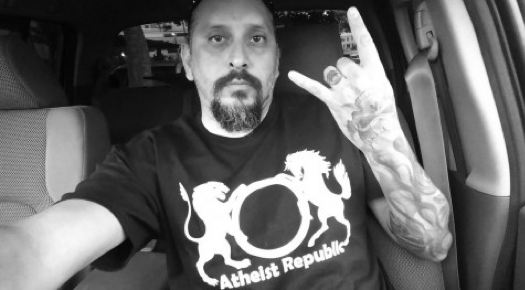 Atheist Republic offers designs that will definitely make you look stylish so start choosing from our wide selection of inspirational atheist buttons today! In fact, you can also customize your own buttons with your favourite colours and fonts. We offer a wide range of products that are suitable to the tastes of different people. If you have ideas that you think we could showcase on our gallery, feel free to share them with us so more people can make good use of them.